Easy, automatic tacking and jibing. As your boat tacks or bears off to sail downwind, and the sheets are eased, the Hoyt Jib Boom ™ maintains precise control of the jib, especially the leech. 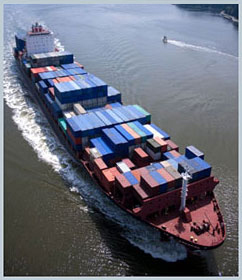 This results in remarkable performance improvement and ease of handling. 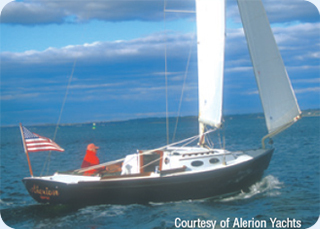 Proven on thousands of sailboats and numerous trans-oceanic passages. 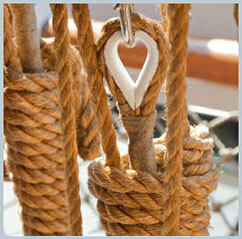 Perfect trim of your 100% self-tacking jib - sailing Wing and Wing is actually easy! Sail easier, smoother and faster with your Hoyt Jib Boom. 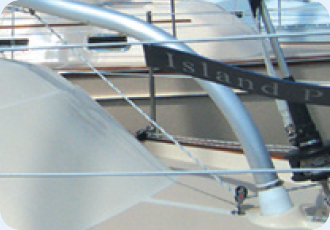 The typical base placement (center of the pedestal base) is 10% aft of the headstay. This is not a critical location, but rather a “Rule of Thumb”. Various obstacles can obstruct the pedestal base position. All knuckles are bent to 57 degrees. All pedestals are set at 23 degrees. All angles are calculated on a perfectly flat and level deck. Wedges will be required on many installations to make up for deck camber. A universal black molded urethane wedge which can be cut to fit is available from Forespar®. 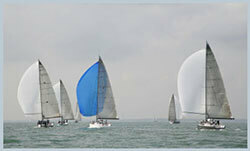 • Sail more easily and more efficiently! 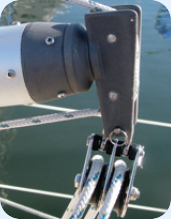 • Perfect trim of your 100% self-tacking jib Wing and Wing downwind "